Brian Eno is the one name in music who is connected to musicians as diverse as U2, Luciano Pavarotti, Nico, Karl Hyde and Coldplay. Famously having described himself as a ‘non-musician’, Brian Eno has been credited as composer, singer, keyboardist, producer, clarinetist, instrumentalist, vocalist, mixing engineer, video artist, and app designer. His name is short for Brian Peter George St John le Baptiste de la Salle Eno and his cerebral approach to music has even earned him a nickname – ‘Professor’. It was a chance encounter that brought Brian Eno into professional music instead of the art career that he was pursuing. 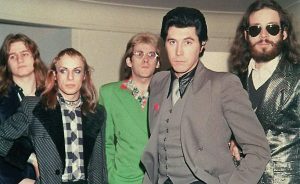 He became a founder member (1971–1973) of the glam/art rock band Roxy Music, initially not even appearing on stage at their live shows, but operating the mixer, processing the band’s sound and singing backing vocals. Eventually when he did become a performing member of the band, he was known for his outrageous and flamboyant costumes and makeup. After being done with the promotional tour for the band’s second album, For Your Pleasure, he quit the band. Following this, Eno had a solo career beginning with the album, Here Come the Warm Jets, which was a mix of glam rock and art pop. Between 1973 and 1977, he created four albums of electronically inflected art pop. Besides this, Eno played the clarinet for the performance art-classical orchestra the Portsmouth Sinfonia. The orchestra’s first album The Portsmouth Sinfonia Plays the Popular Classics was produced by him and in 1974, he produced the live album Hallelujah! The Portsmouth Sinfonia Live at the Royal Albert Hall. The orchestra was a mix of musicians with musical training as well as those without any training, leading to interesting results during their performances. The orchestra also included musicians whose solo work he would go on to release on his Obscure label including Gavin Bryars and Michael Nyman. Soon after this, the story goes that after being hit by a taxi, Eno was confined to his bed. An old record of harp music that his girlfriend had brought him played out of a system, with the amplifier set very low and which had one channel of the stereo not working. This experience inspired him to experiment with a genre of music that is part of the environment, like the trees and the rain. Eno came up with the term ambient music and he went on to make several albums dedicated to the genre. Brian Eno’s various avatars in music cannot be clearly separated into phases. His eclectic and long career includes experiments and innovations of various kinds. As a producer and musician, he was instrumental in defining the sound of some big names in music. He collaborated with David Bowie on his Berlin trilogy, transformed U2’s Achtung Baby into one of the greatest rock albums and put his distinctive stamp on Talking Heads’ Remain in Light. 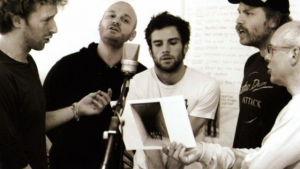 The genre of ambient music that he pioneered also defined his sound and influenced records that he produced with bands such as Coldplay. As a producer, his went on to produce award-winning albums for U2, Laurie Anderson, Jon Hassell, Talking Heads, Devo, John Cale, Grace Jones, Slowdive, Coldplay, James Blake, Damon Albarn, and numerous others. His music has been heard in concert halls, arenas, airports, movie theaters, and art galleries. He has also created scores for TV series, films and furthermore wrote the start-up sounds for Windows 95, easily making him the most-played composer of the 90s. During the ‘90s, Eno also worked with self-generating musical systems, the results of which he called generative music. This allows the listener to hear music that slowly unfolds in almost infinite non-repeating combinations of sound. This music he then presented in his own art and sound installations and those in collaboration with other artists. 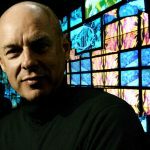 Brian Eno was among the first to explore the artistic potential of immersive technologies developed mostly for the video game industry, and also the first to introduce the genre “world music” through the Talking Heads’ album My Life in the Bush of Ghosts. All of the above are just a few of his creations in his extensive body of work. In the last ten years, he has released collaborative albums with Byrne, Underworld’s Karl Hyde, and poet Rick Holland, singles with Nicolas Jaar and Kevin Shields, a breathtaking Lou Reed cover on an otherwise ambient concept album about a ship and that is besides his installation work, paintings, interactive phone apps, and a re-issue of Oblique Strategies, a deck of 155 cards bearing creative maxims that deserves a permanent place on everyone’s desk.